With the froth and foam of the festive season giving way to a cold and dark January I wanted to act on the idea of creating some of the finest ever science fiction tank models for The Ion Age and sat down to discuss ideas with my good friend Jim Brittain. For those of you who are keen to know 'Taranis' is an ancient celtic/arthurian deity who was the god of thunder and ruination. An excellent name eh! I explained my idea to Jim and set out my stall to him. 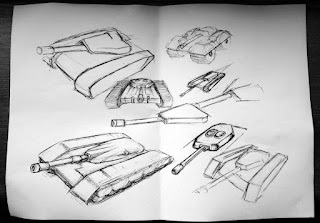 I wanted to design a tank, in fact more than one. I wanted to create a range of heavy armoured vehicles to go into our range. A Tank is the core vehicle of any force in wargaming, its the master of the battlefield and the spear tip of all assaults. Its the natural place to be with wargaming vehicles. I wanted to create the finest tank on the market. That was my vision. 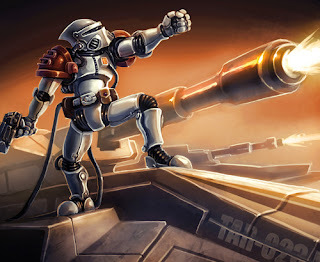 A tank that was the envy of my gaming buddies that combined all that was best from sci-fi movies and books, from the real world too. I wanted a series of parts which could be combined over and over to create many variants and a vehicle that would be equally at home in the Ion Age setting as well as in any other setting and campaign. Oh, and I wanted a tank that would stand up to continual use on table, durability as well as beauty that is often overlooked in the market these days. 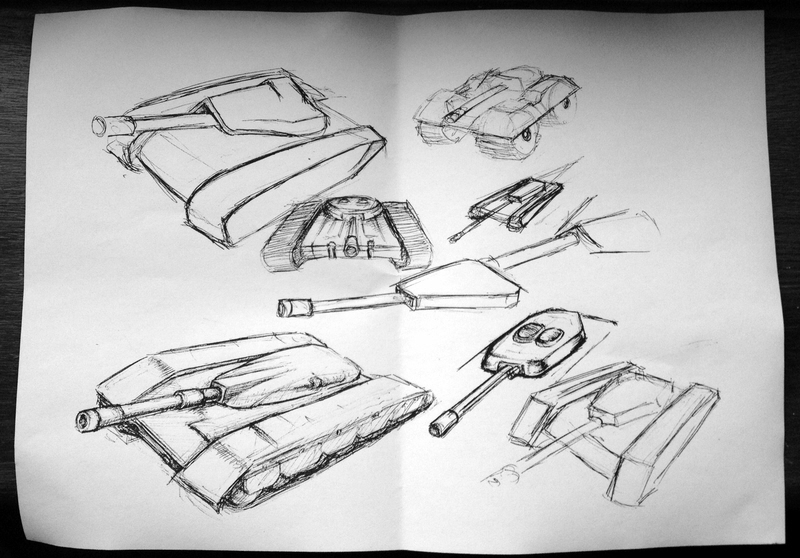 We discussed the Taranis needs and focused on sloped armour and a single turret, both central to most tank designs (at least Human ones!). A chassis of a shape which would allow the 'bolting on' of different kinds of propulsion's such as tracks, wheels, hover and anti-gravity. A clever turret ring assembly that would suit all kinds of weapons or exotic mounts atop it. The sketches you can see at the foot of this post took shape. Now we had something simple to look at and build on. Exciting! But as Jim and I agreed we would need a whole team of talented people if these Taranis sketches were to become more than an idea. If it was to become a reality. For the best tank ever we would needed a designer...a damn good one. I had just the legend in mind whom I had worked with before on projects for Alternative Armies and he agreed to design Taranis. Mr Bob Naismith would create for The Ion Age all of the parts to bring Taranis to life! This was all several months ago and while Jim Brittain has now taken a rear seat and handed over to Sam Croes our lead designer all of the concepting is complete and Bob Naismith has now completed his design work. We are now onto origination molding! In the next blog post we will show you some original 3D printed pieces as well as some renders and talk about the more than twenty variants of Taranis that are coming your way this Autumn and towards year end. Thanks Alison and an early happy birthday to you too. The Taranis will set some design elements for us in some ways. Same enough to work but a little special too. Thanks Zac. They will not be as wacky as Malig ball tanks but they will have some special features. I like the one with the big wheels. Thanks Stroezie. We did go with a wheeled version and the wheels are larger than those on the Mullo for sure. More information next week. I second the big wheels. ..pation. Another post next week. Thanks. IAF076 Retained Lance Command Charlie released! Pebeo Paints back in full stock!